Diabetes testing-1 | ARKRAY, Inc. In the summer of 1979, a development theme for a new instrument was determined, and a team of 6 - 7 engineers of machines, electronics, and software was organized. The theme was to develop a testing instrument using hemoglobin A1c (HbA1c) analytical column, which was a collaborative project of Sekisui Chemical Co., Ltd Central Research Institute and Osaka City University Medical School. In those days, it was not practical to measure HbA1c because the hemoglobin analyzer was too expensive and difficult to use, and it took as long as 24 hours for measuring. 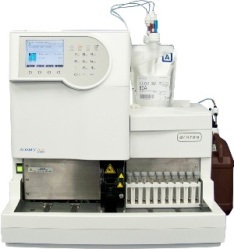 The goal for the development team was producing a single-analyte hemoglobin analyzer which could be operated even by a lay user on a daily basis. HbA1c, a type of glycated protein, is a binding of hemoglobin (protein) and glucose (sugar). HbA1c accounts for about 4 to 15 % of total hemoglobin. Since HbA1c represents the average blood glucose level of the past 2 weeks, it is an indispensable test item for diabetes diagnosis and care. Measuring HbA1c requires fractionating hemoglobin into various different types of hemoglobin for quantification where the proportion of the different hemoglobin is calculated. Liquid Chromatography (LC) method was typically used for this. Liquid chromatography has a long history. It is said that it was originated in a discovery by a Russian botanist. The Russian botanist Mikhail S. Tswett (1872-1919) found that pigment composition became separated when plant pigment (chlorophyll) together with petroleum ether went through calcium carbonate layer. High Performance Liquid Chromatography (HPLC), which is faster liquid chromatography, is now the necessity in separation analysis. 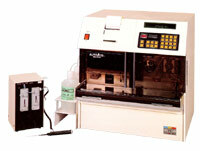 When the new analyzer was being developed, HPLC instruments were on the market as general-purpose instruments. However, they were used only in university laboratories, professional analysis companies, and some test institutions, because they were huge and complicated system that required expert operators to keep stable use condition. In addition, even small changes in flow volume, pressure, temperature, and chromatography column would cause a big difference in the test result, so that people believed that HPLC was not suitable for quantitative analysis in clinical settings. Under the situation, our company's engineers worked hard on what would make it possible to bring in HPLC to clinical fields. They came to the conclusion that the key was the performance stability and the price of the system. In HPLC, the solution sending pressure sometimes goes up to 50Kg/cm2 or more (the same pressure you get in 500m water depth), so the new analyzer needed many unusual components that were most unlikely in ordinary automatic biochemical test instrument (such as high-pressure solution sending pump, high-pressure bulb, high-pressure damper etc). If we had bought all of these components, it would have cost us tens of millions of yen. Thus, we decided to make the components in our company, making the best of all the HPLC techniques that had been developed until then. Most of the technical challenges were totally new for our development team -- development of flow cell optical system with small dead volume and good linearity, high-pressure pump with little pulse, high-pressure injection bulb, floating point calculation software with wide dynamic range, control of new microcomputer system, etc. We achieved them one by one, and made high-quality and low-price components, and finally succeeded in developing a HPLC system for high performance at reasonable price that could be accepted by general hospitals and test institutions. Our company took charge of the development of the instruments and Sekisui Chemical took charge of the development of the chromatography column. Together we gave birth to HA-8110, the world's first HPLC HbA1c fractionation quantitative analyzer.